Host country Thailand sweeps podium in Expert Class to win its third overall title The 6th YAMAHA ASEAN CUP RACE Novice champion is new 14-year-old star from Malaysia - News Releases | Yamaha Motor Co., Ltd.
Over the two days of January 17 and 18, 2009, Yamaha Motor Co., Ltd. and Thai Yamaha Motor Co., Ltd. held "The 6th YAMAHA ASEAN CUP RACE in Thailand" at the Bangkok Racing Circuit (overall length: approximately 1,100 m). 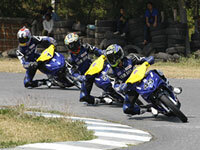 The YAMAHA ASEAN CUP RACE is an international race where riders who have qualified in national competitions in the participating countries compete for the title of No. 1 in the ASEAN region in two classes, Expert and Novice. This is a one-make competition using Yamaha's popular ASEAN market deluxe moped model T135 (Thai market name: SPARK135) and T110 (Thai market name: SPARK110), with all machines tuned to equal performance standards. The races are conducted in a two-heat format with winners decided on the basis of total points for the two heats. 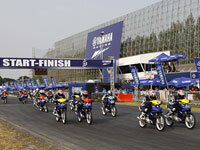 Participating in this 6th YAMAHA ASEAN CUP RACE were qualifying riders from national competitions in the five countries of India, Indonesia, Malaysia, the Philippines and the host country, Thailand. A crowd of some 25,000 turned out to see the final races on January 18 (Sun.) at the Bangkok Racing Circuit adjacent a large shopping mall in the Thai capital. The first heat of the Expert Class was won by Thai rider Worawut Puttho to the excitement of the local fans. The second heat was won by another Thai rider, Chanon Chumjai, who had won pole position in the Saturday qualifying and finished 2nd in heat one. 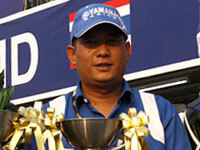 These performances made Chanon Chumjai the sixth YAMAHA ASEAN CUP RACE champion. Meanwhile, the Novice class championship went to 14-year-old Hafizh Syahrin of Malaysia, who was competing in his first ASEAN CUP and amazed the crowd with his riding process in winning the first heat and finishing 2nd in heat two. Also, by sweeping 1st to 3rd places in the Expert Class, the host country Thailand won its third overall championship title, following titles in 2004 and 2005. 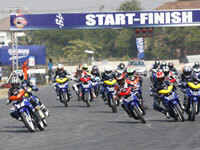 Plans call for the 7th YAMAHA ASEAN CUP RACE to be held in Indonesia, which also hosted the 1st and 4th ASEAN CUP races. For this 6th YAMAHA ASEAN CUP RACE, the event color was changed from the YAMAHA Red of previous years to the new YAMAHA Racing Blue. And, reflecting the perception of this race as an important opportunity to nurture talented young riders, many of the teams were full of the new faces of first-time participants and riders moving up from the Novice to Expert classes. 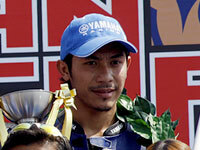 In the Saturday qualifying, Thailand's Chanon Chumjai won the Expert Class pole position for Sunday's races. Despite competing in the Expert Class for the first time, he was the only one to break the 1 min. 24 sec. barrier with a 1 min. 23.788 sec. lap time on the highly technical 1,100m track with its combination of a long straight and a total of 17 high- and low-speed curves. Race day, Sunday the 18th, began with a 15-minute warm-up session for the riders to make their final adjustments. Then, after a warm and hospitable opening ceremony, the racing began with the first 12-lap heat of the Novice Class competition. That first heat was won by Malaysia's Hafizh Syahrinon on machine #7 starting from second position on the grid. After taking the hole shot, however, Hafizh was passed by Thailand's Thanate Sukchalern (#29). On lap two Hafizh would drop as low as 5th position before working back to 3rd on lap 8 and 2nd on lap 9. On lap 10 he took back the lead while recording the fastest lap of the race, and then pulled away from the competition to win eventually with a 5-sec. lead. Finishing 2nd was Indonesia's Topan Sucipto (#50), who had led the race from lap 6 before finally being passed by Hafizh. Third place went to Thailand's Kitsiphat Prashanphot (#39), with teammate Thanate following in 4th. In the second heat run after the lunch break, Hafizh once again got the hole shot to take the early lead. But Thanate was soon on his tail and the two riders raced on in unison, neither giving an inch. Finally, Thanate used the slipstream to cut inside Hafizh on the first corner of lap five and take the lead. Although Hafizh continued to race hard and run faster lap times later in the race, he failed to catch Thanate at the checkered by just a 10th of a second. In the Expert Class that always brings highly competitive races every year, the race distance was 15 laps. Taking the early lead in the first heat was the pole starter, Chanon Chumjai of Thailand on machine #53. He was followed by Thai teammates Thitipong Warokorn (#1) and Worawut Puttho (#45). On lap two Worawut moved into 2nd position as the three leaders opened up a more than 2-sec. gap over the rest of the field. As the leader Chanon began to slow slightly later in the race, Worawut took over the lead on lap seven. The top three kept those positions to the end of the race, thus giving Worawut his first victory in six years of competing in the ASEAN CUP RACE. Following Chanon and Thitipong in 4th place was yet another Thai rider, Pattanapong Maneesri (#34), giving the host country a sweep of the top four places. The last race of the day was the second heat of the Expert Class competition. Getting the hole shot in this race was the first heat's 3rd-place finisher, Thitipong. He was followed by Chanon in 2nd and Maico Greg T. Buncio (#10) of the Philippines in 3rd. On lap six, Chanon took over the lead and began to break away from the rest. But Thitipong fought back to retake the lead on lap 11 and run on to the win. Behind them, a tight battle for 3rd developed between Malaysia's Ahmad Fuad Baharudin (#26), Buncio and the first heat's winner, Worawut. In the end it was the veteran Ahmad who won the 3rd spot on the podium, but what impressed many of the spectators was the sight of the six top finishers grouping together on the cool-down lap to congratulate each other for a well-fought competition. It was a scene that emphasized one of the main purposes of the ASEAN CUP RACE: international exchange and friendship. Besides all the exciting racing, visitors to the event got to share other aspects of the joys and excitement of motorcycling through a number of special attractions at the event venue, including a "YAMAHA GALLERY" presenting YAMAHA as the "Sporty, Stylish and Innovative" brand and a Yamaha Bike Festival with numerous attractions organized by Thai Yamaha Motor. "Since this was my first YAMAHA ASEAN CUP RACE, I just wanted to race as hard as I could. I won the first heat and was feeling good in the second heat too, so I was a little disappointed when I finished 2nd. But I am really grateful to have had this opportunity to race against experienced riders in an international competition like this. I want to make use of this experience in our national competition and get stronger so I can return to the YAMAHA ASEAN CUP RACE again. 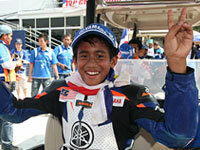 I want to continue to practice hard here in ASEAN racing and someday become a MotoGP rider." "This was my first international race and I didn't know what to expect from the other riders, so I was just determined to do the best I could. It has been a very special experience to be able to compete against such good riders in such a high-level competition. I think I was able to win the second heat because I was able to stay calm and concentrate on my bike control." "The Thai team had very strong teamwork. Since this was my first time competing in the YAMAHA ASEAN CUP RACE, I believe that I was able to win the pole position and 3rd overall because of the great advice I got from the senior members of the Thai team." "This was my first time competing in the Expert Class of the YAMAHA ASEAN CUP RACE but I felt good in the competition, especially because I was able to start from the pole position. On the Thai team, everyone gets together to help each other out whenever someone has a problem. I know that I was able to do well this time because of the help of my team. I am glad that I was able to respond to the support I got from the team and do my best to help us win the overall team championship." "I always look forward to the YAMAHA ASEAN CUP RACE because, unlike other races where we are just competing against each other, this is a race where everyone is competing together with equal conditions and in an at-home atmosphere under the Yamaha brand and even your rivals are friends that you are glad to meet again here each year. I am really grateful for the opportunity to compete here. It was not as if there was any specific pressure because we were the host country this time, but I really wanted to win for the sake of Thai Yamaha. That's why I was so happy that I was able to hold on and finish 4th in the second heat after my machine developed clutch trouble, and then place 2nd overall as a result." "This was my first time competing in the Expert Class but I was able to finish 3rd overall. I think because the condition of the machine was good and it suited this course well. Especially in the second heat when I knew the Malaysian rider was hot on my tail, I gave it my all to hold my position for the sake of our team. I did everything I could not to let him pass me." "I am very happy that we were able to sweep the top three places in the Expert Class and win the overall team title this time as the team of the host country. Although we missed winning 1st place in the Novice Class, we were able to get 2nd and 3rd places, which bodes well for the future. And I am especially happy because we came to this competition with many new young riders on our roster who were competing in the ASEAN CUP RACE for the first time, especially in the Novice Class. Their success is due, I believe, to the good teamwork on the Thai team." 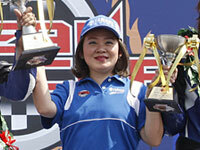 "I am very happy and grateful that the 6th YAMAHA ASEAN CUP RACE has come to such a successful conclusion. We owe so much of this success to the great organizational efforts and warm hospitality of the people of the host country, Thailand, and also to the great passion for motorcycle sports shown by all the participants. I want to thank everyone for this. Until now we have held the YAMAHA ASEAN CUP RACE each December, but this time political events in Thailand caused it to be postponed until January. That is part of the reason why the Singapore team, which has participated each year since the first holding, had to withdraw this time and we where not sure at one point whether the event could be held at all. So I am very glad that we were able to hold a successful event and welcome the participation of India for the first time as well. 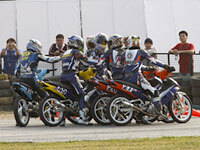 This was the sixth YAMAHA ASEAN CUP RACE. For six years the grassroots efforts of many people to hold these races have provided an arena that has helped the riders and mechanics and racing team staffs improve their skills measurably. And it has been especially rewarding this time to see so many young riders in their teens and early 20s participating and competing so well. It makes me very happy to see how many people have come to recognize the YAMAHA ASEAN CUP RACE as a potent symbol of motorcycle sports in the ASEAN region. Although we speak of the ASEAN in a word, the motorcycle markets and the approach to race activities are different in each country. But with full appreciation of these different conditions in each country, we want to continue organizing the YAMAHA ASEAN CUP RACE as a central event for the promotion of healthy motorcycle sports in the region." 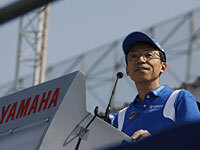 "I believe the YAMAHA ASEAN CUP RACE is an event that has been sustainable because it is an event of the Yamaha family. With not only the races but also the YAMAHA GALLERY, the customized bike contest and the concerts, I believe this to be an ideal event for promoting the fun and benefits of a lifestyle with a motorcycle and the sport, innovative Yamaha brand image to the younger users that have been growing in number here in the Thai market since last year. That is why we are so happy to have been able to host the event again this year as a follow-up to the successful last hosting in 2005. I want to express our thanks to all the motorcycle fans who turned out for this event and all the participating riders, mechanics and team staff from each country and everyone else involved. And I think that by holding this event in conjunction with local races, we have shown local riders an exciting competition in the YAMAHA ASEAN CUP RACE that they can dream of entering some day. As the representative of the host country, I would like to wish you all the best until we can meet again."